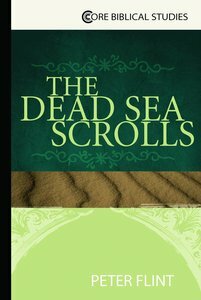 An essential guide to the most significant discovery in the history of biblical studies - the Dead Sea Scrolls. ^^In 1947, a Bedouin shepherd literally stumbled upon a cave near the Dead Sea, a settlement now called Qumran, to the east of Jerusalem. This cave, along with the others located nearby, contained jars holding hundreds of scrolls and fragments of scrolls of texts both biblical and nonbiblical - in Hebrew, Aramaic, and Greek. The biblical scrolls would be the earliest evidence of the Hebrew Scriptures, or Old Testament, by hundreds of years; and the nonbiblical texts would shed dramatic light on one of the least-known periods of Jewish history - the Second Temple period. This find is, quite simply, the most important archaeological event in two thousand years of biblical studies. The scrolls provide information on nearly every aspect of biblical studies, including the Old Testament, text criticism, Second Temple Judaism, the New Testament, and Christian origins. ^^It took more than 50 years for the scrolls to be completely and officially published, and there is no comparable brief, introductory resource that brings this astounding body of information up to date. ^^Peter Flint, world-renowned scholar, will address all areas of the Dead Sea Scrolls: the many texts involved; the context of Jewish history; impact on the canon, text, and modern translations of the Old Testament; theological significance; connections between Jesus and the Dead Sea Scrolls; and the Scrolls and other New Testament writings. - Publisher In 1947, a Bedouin shepherd literally stumbled upon a cave near the Dead Sea, a settlement now called Qumran, to the east of Jerusalem. This cave, along with the others located nearby, contained jars holding hundreds of scrolls and fragments of scrolls of texts both biblical and nonbiblical-in Hebrew, Aramaic, and Greek. The biblical scrolls would be the earliest evidence of the Hebrew Scriptures, or Old Testament, by hundreds of years; and the nonbiblical texts would shed dramatic light on one of the least-known periods of Jewish history-the Second Temple period. This find is, quite simply, the most important archaeological event in two thousand years of biblical studies. The scrolls provide information on nearly every aspect of biblical studies, including the Old Testament, text criticism, Second Temple Judaism, the New Testament, and Christian origins. It took more than fifty years for the scrolls to be completely and officially published, and there is no comparable brief, introductory resource. Core Biblical Studies fulfill the need for brief, substantive, yet highly accessible introductions to key subjects and themes in biblical studies. In the shifting tides of biblical interpretation, these books are designed to help students locate relevant meanings in conversation with the text. As a first step toward substantive and subsequent learning, the series draws on the best scholarship in order to provide foundational concepts and contextualized information on a broad scope of issues, methods, perspectives, and trends. About "The Dead Sea Scrolls (An Essential Guide)"
In 1947, a Bedouin shepherd literally stumbled upon a cave near the Dead Sea, a settlement now called Qumran, to the east of Jerusalem. This cave, along with the others located nearby, contained jars holding hundreds of scrolls and fragments of scrolls of texts both biblical and nonbiblical-in Hebrew, Aramaic, and Greek. The biblical scrolls would be the earliest evidence of the Hebrew Scriptures, or Old Testament, by hundreds of years; and the nonbiblical texts would shed dramatic light on one of the least-known periods of Jewish history-the Second Temple period. This find is, quite simply, the most important archaeological event in two thousand years of biblical studies.